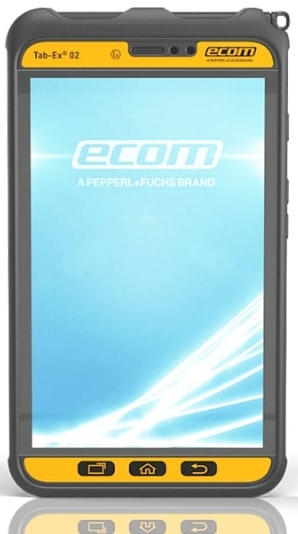 ecom's hazardous area tablet, the Tab-Ex 02, based on Samsung's state of the art Galaxy Tab Active2, leverages Samsung's know-how and brings a new level of customer focused solutions and increased ease of use to mobile workers in Oil & Gas, Refining, Chemical, Pharmaceuticals and other hazardous industries. The lightweight and robust Tab-Ex 02 with the high-performance Android 7.1 Nougat operating system features a powerful Octa Core processor with 1.6 GHz and 3 Gigabyte RAM. Thereby ecom provides the technological basis for complex applications that connect people, processes and systems through the Internet of Things and will be a decisive factor for a company's success in the coming years. The improved hardware of the Tab-Ex 02 enables, for example, to identify objects in an installation via augmented reality applications. The software delivers all the underlying, existing data directly into the user's field of vision in real time, while also making it shareable within the company network. Augmented reality ensures greater transparency, higher availability and faster as well as safer processes - from the planning to the operation and maintenance of a plant.